WINDTECH Consultants was established in 1991 offering advanced wind engineering services, primarily in the study of wind effects on large structures, façade cladding as well as environmental wind effects. Tony Rofail, one of the current directors was instrumental in setting up Windtech’s first wind tunnel facility in 1991, having completed his postgraduate research on the subject of Reliability of Wind Tunnel Testing. Tony has since provided contribution to wind engineering through the draft AWES Quality Assurance Manual for Wind Tunnel Testing issued in 2001 and is currently a member of the Australia and New Zealand Standards Committee for Wind Action on Structures. Since its establishment, the company has provided wind engineering and related high technology services for over 2,500 major building projects, assisting planners and building design professionals. Since 1996, WINDTECH Consultants has also provided services relating to Environmentally Sustainable Development (natural ventilation, thermal load assessments, solar glare, daylight, shadow studies, NCC DTS compliance for energy efficiency, just to mention a few). Wind loading is becoming an increasing important factor in the viability of large building projects due to the increasing trend towards taller, larger and lighter structures. The move towards more efficient design for wind loading, achieved through site specific modelling using wind tunnel testing generally results in significant savings in the cost of the facade and the structure in comparison with the use of estimates from wind loading standards. WINDTECH Consultants is one of the world’s leading Wind Engineering laboratories. Analysis techniques developed by WINDTECH Consultants over the past few years place the company at the forefront of its field in the analysis of the effect of wind on the most complex structures. This has been possible through WINDTECH Consultants’ policy of continual research and development and improvement. It was this policy that drove Windtech to assist in the development of improved analysis techniques, such as in the study of the effect of load transfer between linked tall building structures as well as the modelling of the effect of coupled modes of vibration in tall buildings. 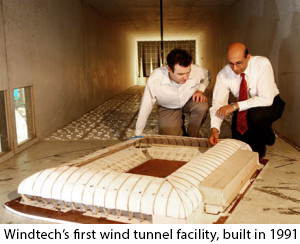 Windtech’s head office in Sydney accommodates 3 large commercial wind tunnels, including a wind tunnel capable of testing bridge decks. Our façade pressure measurement system is the world’s most advanced, capable of handling over 1,000 simultaneous pressure sensors at unsurpassed sampling rates with very minimal phase lag. The company through its extensive experience and client focus, has become widely recognised as the go-to people for complex environmental design problems including remedial studies. Our experienced staff are highly trained in arriving at simple and effective solutions for very complex wind environment problems, natural ventilation performance, minimisation of thermal loads, wind-driven rain, mitigation of the effect of air pollutants, wind-noise and in the design of dampers to control motion in tall buildings. Our solutions are unique in that they do not significantly impact the architectural intent and tend to be cost effective.